Mention creativity, and what comes to mind? For many of us, creativity is the province of someone with a singular gift toiling away in service to their art. From this perspective, creativity is a solitary endeavor - the struggle of the individual to express their distinctive vision to the world. But what if we looked at creativity through a wider lens, as a dynamic force that animates us and connects us with every being on the planet? From this perspective, creativity is not just a spark igniting the fire of inspiration. It is a way of living spontaneously from the sacred space within us - from the source of infinite potential and positive qualities, such as love, compassion, and joy. Expression in any voice, any form that emerges from this core, has the power to heal us and benefit others. The heart of creativity is being of service. 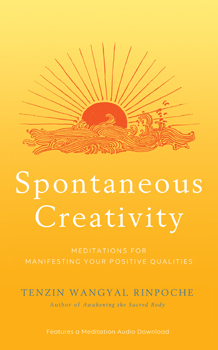 Acclaimed author and meditation master Tenzin Wangyal Rinpoche draws on the ancient wisdom of the Tibetan Bon Buddhist tradition to guide us in developing the ability to show up fully for our lives and clear whatever blocks us from expressing our creative gifts for the greatest good.